Merry Christmas and a Happy New Year from Stephen McGowan Photography! With only TEN (10!) days until Santa comes down our chimney, eats our mince pie and drinks our glass of milk, we would like to take this opportunity to thank everybody we've worked with in 2015. To our fellow wedding suppliers, a big thank you for being amazing and incredible at what you do! We've certainly made a few good friends over this past year through many different ways: a brochure, wedding photography courses, recommendations, or just on a drunken night out! I believe these meetings happen for a reason and it's been great to get to know, and work with new suppliers in the wedding industry. First of all a big thank you to Relative Communications. This one's a little strange but if it wasn't for a wedding industry brochure being produced for a bridal shop called "Edith and Winston" in Knutsford, we would have never been introduced to Becca and Calumn (sorry Callum!) at Edith and Winston. 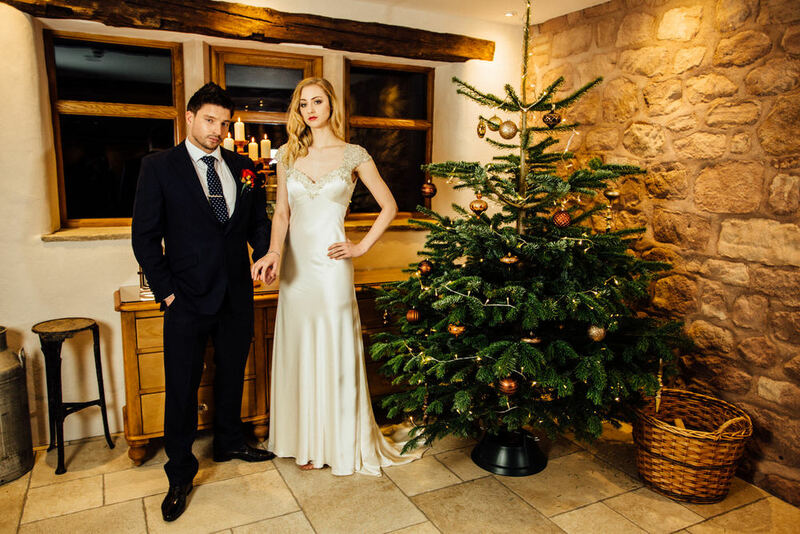 Not only were we introduced to a brilliant family run bridal boutique in the heart of Knutsford, but we also met two lifelong friends in Becca and Callum. We've found that we share similar passions in the wedding industry - a passion and drive to go out of our way for our brides and grooms to and make sure their wedding day is the best day of their lives. When we're together we also love to bounce ideas off one another - it's this creative spark which drives our bridalshoots. 2015 has seen us co-ordinate 4 bridalshoots at various Cheshire wedding venues such as Cranage Hall, Swettenham Arms, Isla Gladstone Conservatory and Willington Hall (NOEL photograph above is the shoot at Willington Hall). The bridal brochure people (Relative Communications) were actually surprised as to how well we 'hit it off'. They would normally use bridalwear stock images for their brochures using images sourced from the dress makers - but for our brochure we were going to collaborate and work together to put together the images for the brochure! (not normally done apparently). So thank you to Relative Communications and their bridal brochure for introducing us to Becca, Callum, Janet and the rest of the team at Edith and Winston! Working with E&W opened up new doorways in the industry with new suppliers such as Stacy and David at 'Love Lights the Way' who we've worked with on two occasions now - lovely guys to work with and have for your light up lettering! Helen at 7th Heaven Bridalwear has been brilliant to work with! when I said that you can meet wedding industry friends on drunken nights out - this was definitely the case with Helen :-) We like to work with Wedding industry suppliers who remind us of ourselves - who like to push boundaries and go that extra mile to deliver the best service for their brides and grooms, Helen is no exception to this. I've seen Helen and Lesley on a number of occasions over at their bridal shop in Congleton and have seen first hand the effort and devotion they put in to make sure that their brides find 'the one'. Backed up by word of mouth good words and a long list of great reviews you can see why they have built such a good reputation. Also a big thank you to my hair-stylist goddess mate from Boutique Hair in Cheadle Hulme: Shoni Williamson. Shoni has produced some absolute wonders for our bridal shoots this year and has always been an absolute pleasure to work with. I really can't wait to be working with Shoni again in 2016! A big thank you to the venues for being brilliant while we've been shooting weddings, notably Nicola and Danielle at Cranage Hall, Natalie at Willington Hall, Shelley and Georgina at Colshaw Hall and Heidi and Gemma at Stockport Town Hall. Also to Sarah, the Heath family and the team at Heaton House Farm and also to the Worth family at Sandhole Oak Barn for collaborating with us for our bridal shoots. A big thank you to our models! Danielle, Kath, Rosie, Georgina, Bo, Katya, Col Ellison, Daniel, Maureen and Gwen! thanks for getting involved in our bridal shoots and smashing those poses! I lastly want to thank my family and friends - 2015 has been a bit of an odd year taking that much wanted dive into the world of weddings and wedding photography and although photography is my life, I appreciate the fact that even in the scary world of self employment and self sustainability where we might go months without seeing each other, you're still there for me whenever I need you and visa versa. 2016 is shaping up to be incredible! We have another shoot with Edith and Winston and Georgina (Fuller Figure Fuller Bust) at the beginning of the year. I also have a crazy plan for a bridal shoot I have yet to release in the open! Weddings-wise, we're already fixed up to be photographing at the following venues: Ashfield House, Cottons Knutsford, Cranage Hall, Willington Hall, The Deanwater, Mottram Hall, Colshaw Hall, 30 James Street Liverpool, The Daffodil Hotel and Spa in the Lake District. We've also recently teamed up with Brides Up North, so keep your eyes peeled for our bridal blogs and wedding hints/tips on their blog.